In 1818 Québécois Father Joseph-Norbert Provencher was sent to Manitoba at the behest of local citizens, the Hudson’s Bay Company and Scottish Lord Selkirk in order to found the first permanent Roman Catholic post west of the Great Lakes in present-day Canada at St. Boniface. 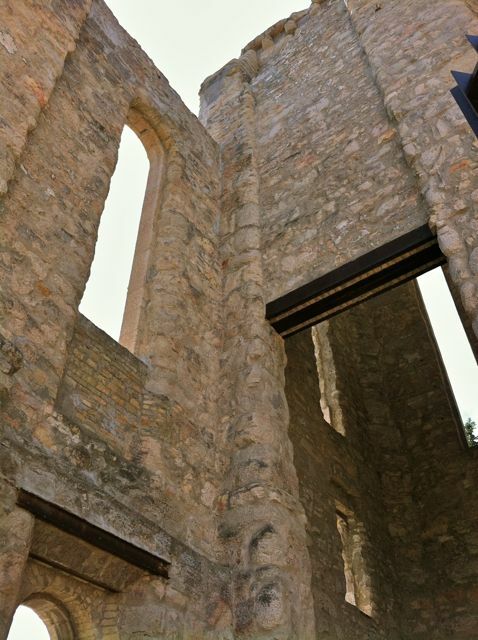 The church was given the title to a large tract of land to the east and south of the forks of the Red and Assiniboine Rivers to aide their efforts. These endeavours led, in 1818, to the construction of the first church in Western Canada, not far from the site of St. Boniface Cathedral. 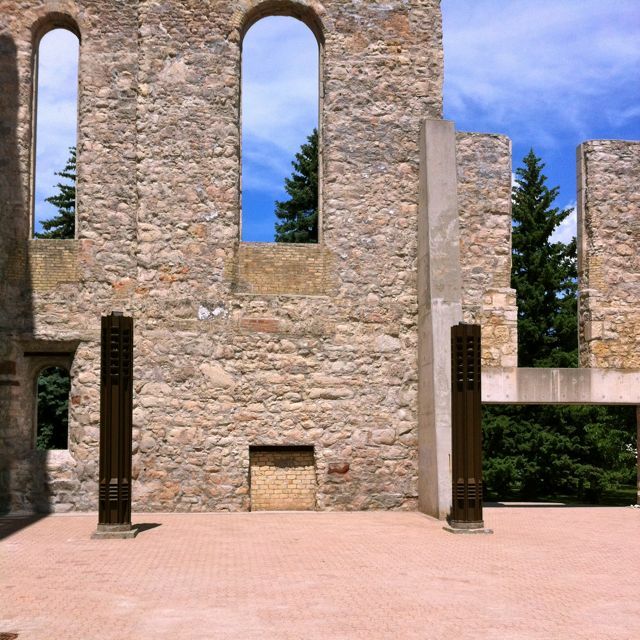 The present St. Boniface Cathedral (partially destroyed by fire in 1968) is the descendent of Provencher’s 1818 church. Its façade and walls date to 1905-08. 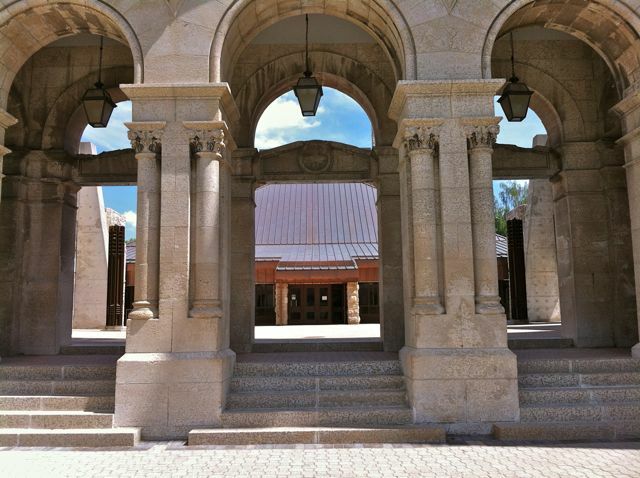 The structure is the third cathedral and fifth church on its site, beginning with Provencher’s humble wood building and progressing to ever more elaborate designs after the diocese was granted cathedral status, in 1847. 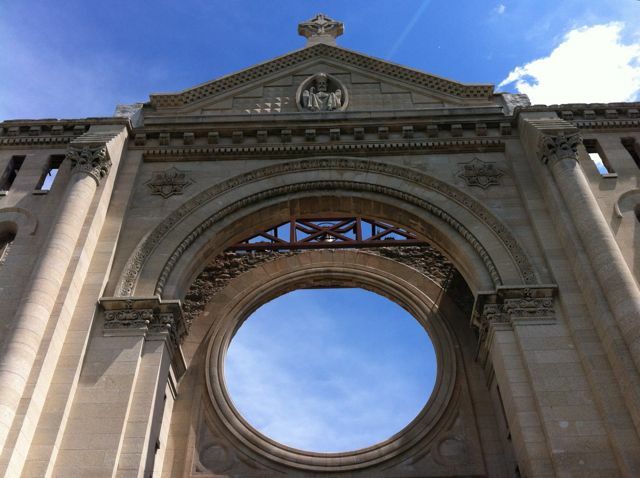 Replacing a building of 1863, the 1905-08 cathedral was designed by Montréal architects Marchand and Haskell. Its original towers (topped by beehive-like roofs) soared to 150 feet and it sat a congregation of 2,050. 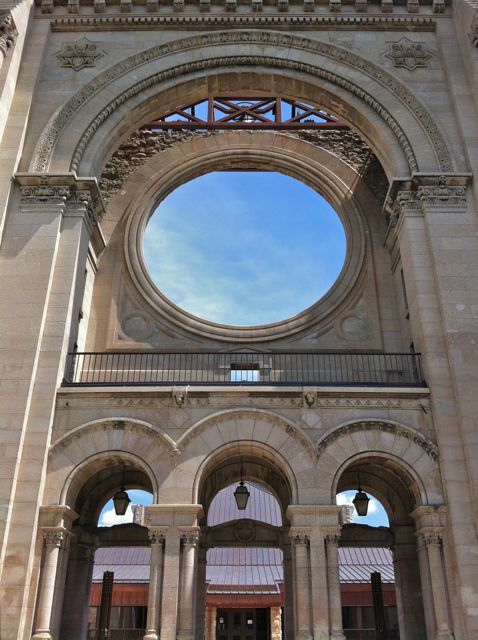 Neoclassical in inspiration, the façade of the cathedral features details borrowed from a number of historical architectural styles, including the Romanesque and the Byzantine. It is visually anchored by an enormous arch, a massive round window opening and a triple-arched entryway at ground level. 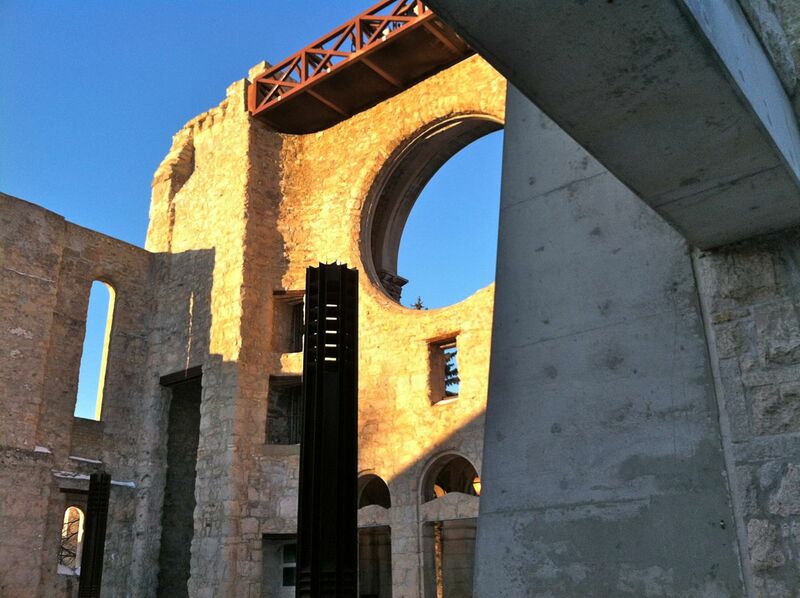 After the fire of 1968, the reconstruction of St. Boniface Cathedral was led by Manitoba architect Étienne Gaboury. A conscious decision was made by Gaboury not to recreate the previous structure and instead create a new hybrid construction. 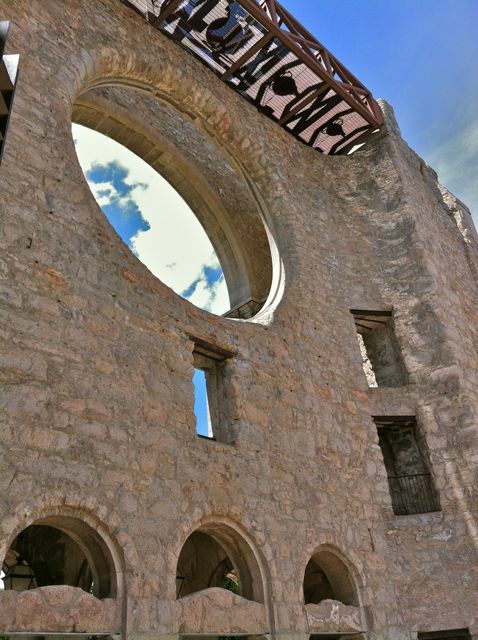 As the architect stated at the time: “We're not trying to reconstruct the old church, we have these ruins, the burning is part of the church's history and from these a new cathedral arises." 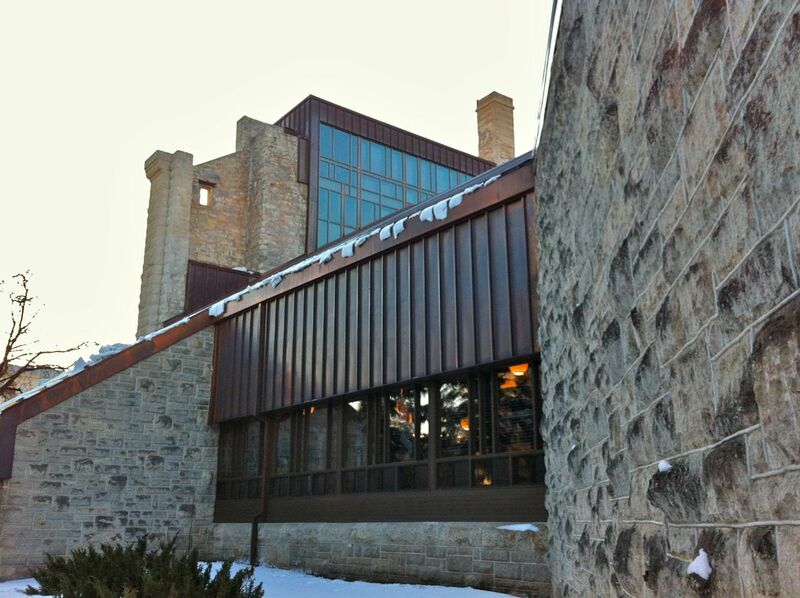 Gaboury carefully situated a new chapel within the ruins of the previous building. 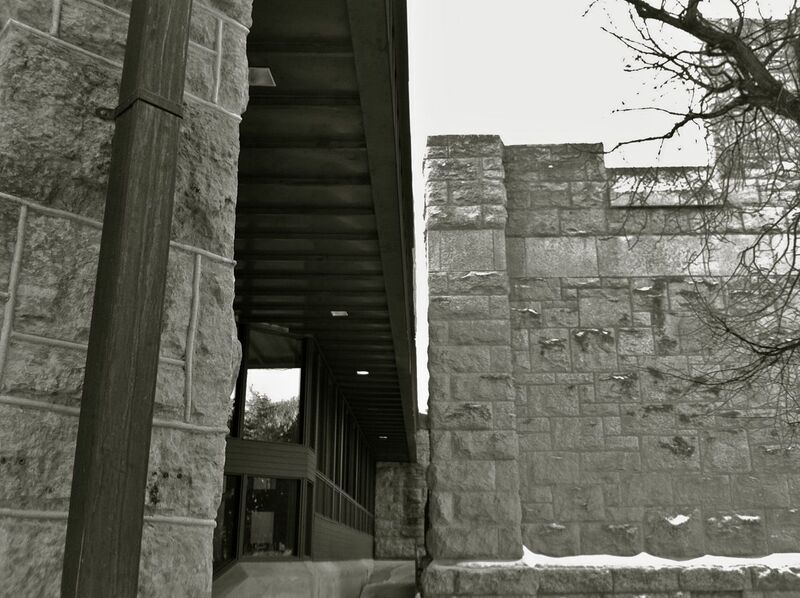 Both the original cathedral and the 1970s structure share the use of Manitoba Tyndall limestone, while the addition is set apart through its angular shapes and materiality. 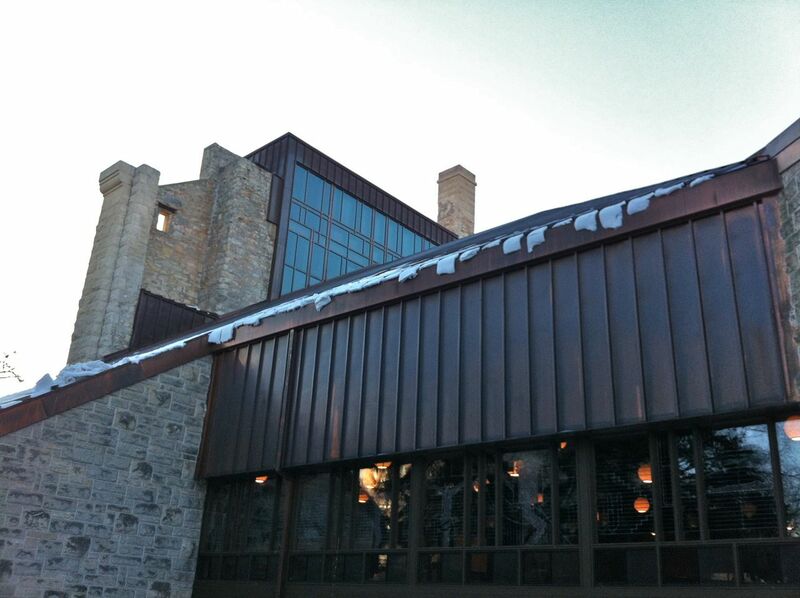 The new cathedral’s interior, defined by warm wood cladding and a soaring canted roof, continues the dramatic focus of Prairie sunlight found throughout Gaboury’s oeuvre. Notably, this was not the first remodelling of a church space in the architect’s career, recalling his earlier repurposing of a small chapel into his firm’s office only a few blocks away. 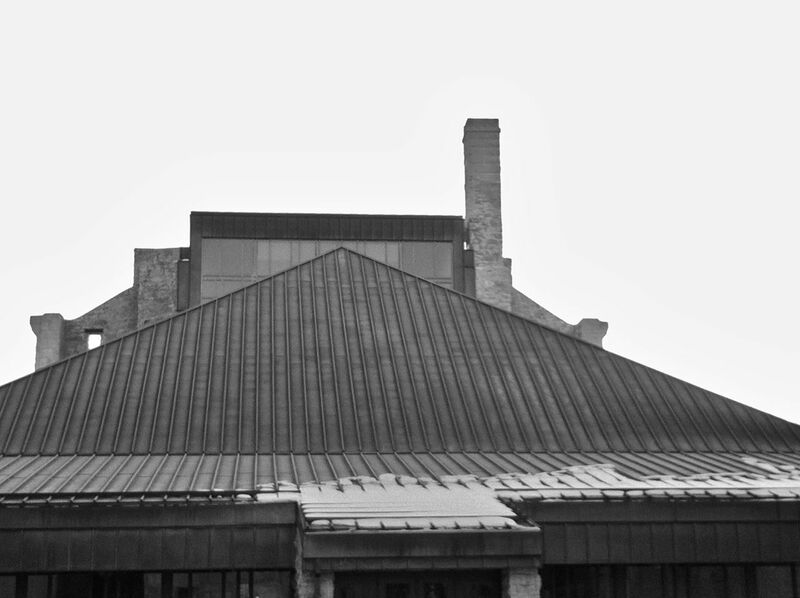 Gaboury’s choice to leave the remains of the original building in a visibly fragmentary state recalls another prominent project of the post-war years: Coventry Cathedral, in the United Kingdom. 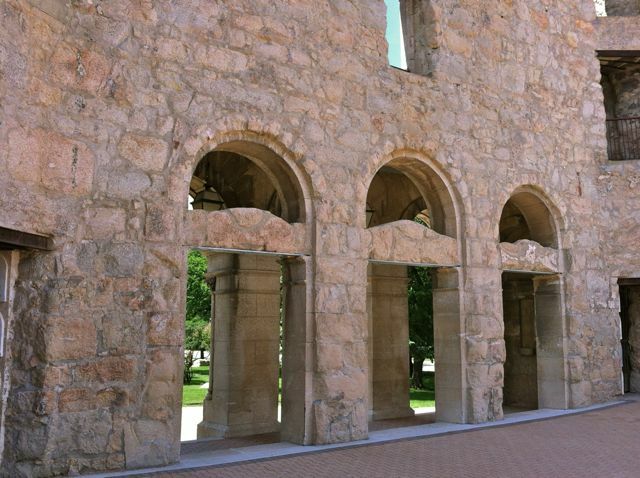 This much-publicized work, executed by architect Sir Basil Spence and engineers Arup, saw the maintenance of a 14th-15th century building much damaged by the German Luftwaffe during the Second World War in concert with the erection of a new modern building sharing the same stone material. 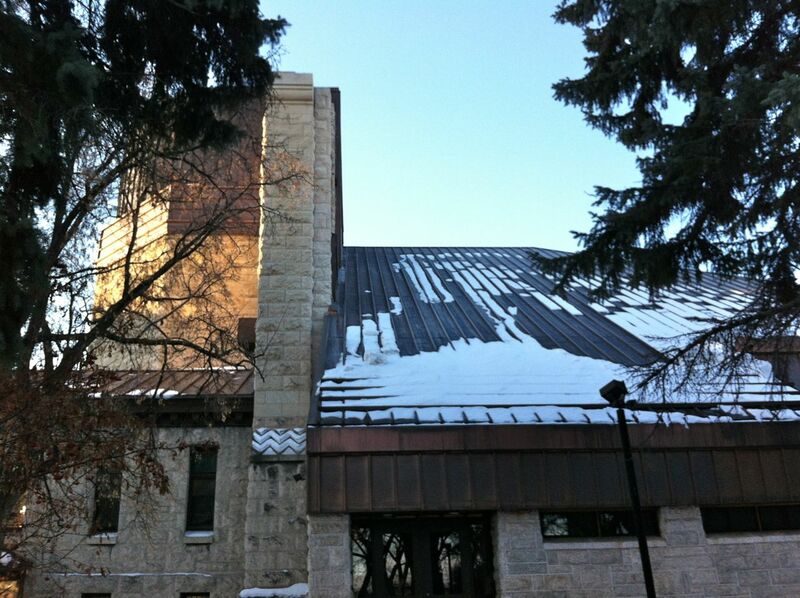 At the same time, the St. Boniface building maintains its own distinct character, the result of the dramatic design of the original cathedral’s facade in combination with Gaboury’s stylized apprach. 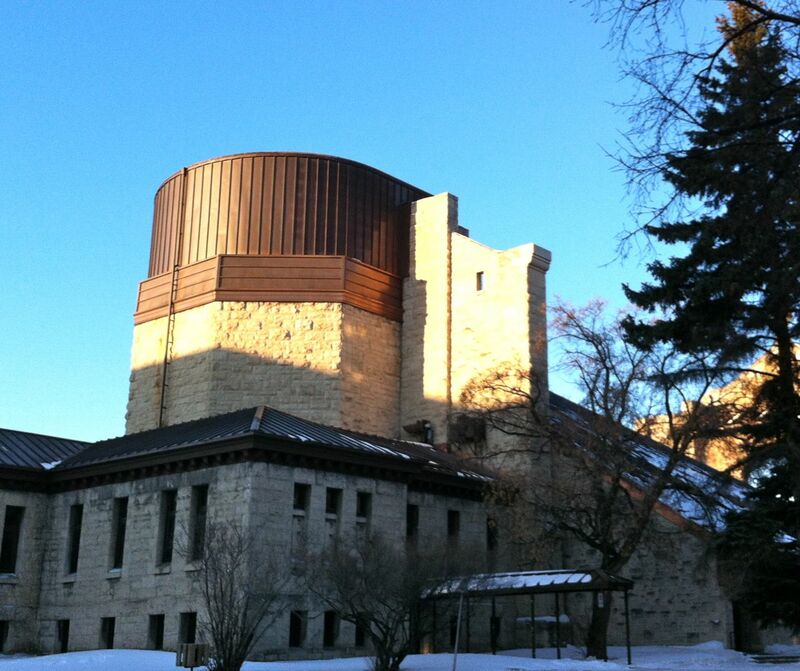 To this day the cathedral continues to serve as a striking landmark in the Winnipeg skyline, one whose impressive appearance speaks to its status as the heart of a diocese which once stretched all the way to the Rocky Mountains. St. Boniface is a Winnipeg neighbourhood on the east side of the Red River. The area is the heart of Franco-Manitoban culture, a Western Canadian hub of francophone culture and an important site in the history of the Métis people and has played an important role in the evolution of the Province of Manitoba. The area around the forks of the Red and Assiniboine Rivers was, for many generations, a site for camping, trading and other activities by indigenous peoples. In the late-eighteenth and early-nineteenth centuries land to the west of the Red River hosted a variety of European settlements, including Forts Rouge, Gibraltar and Douglas and the Red River Colony. 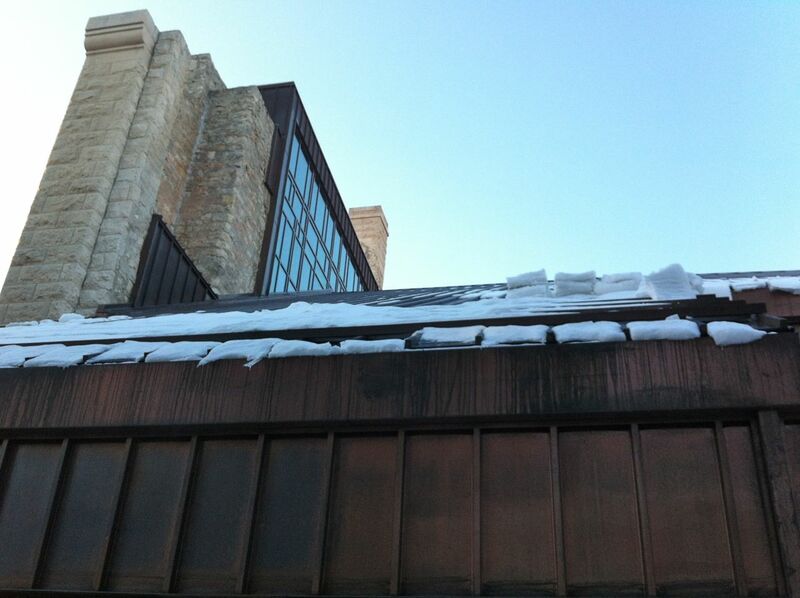 The roots of the present built form of St. Boniface can be found in these years. In the early-nineteenth century the area was settled by groups of Métis fur traders and mercenaries hired to protect the Red River Colony; the latter included the German-Swiss De Meurons regiment. 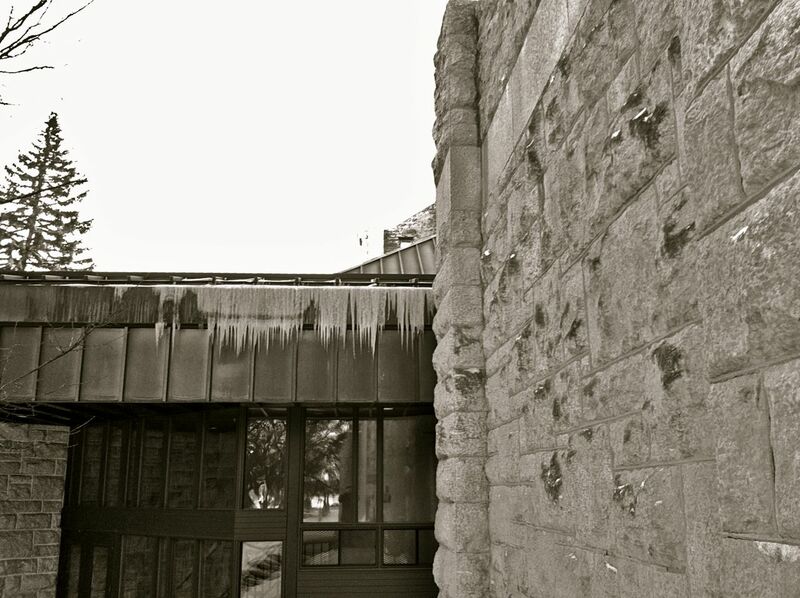 Beyond the cathedral, the early development of St. Boniface district included a school near the 1818 church. These two structures encouraged Catholic colonists to settle east of the Red River. They also set in motion two major themes that would characterize the architecture of the district: religion and academia. 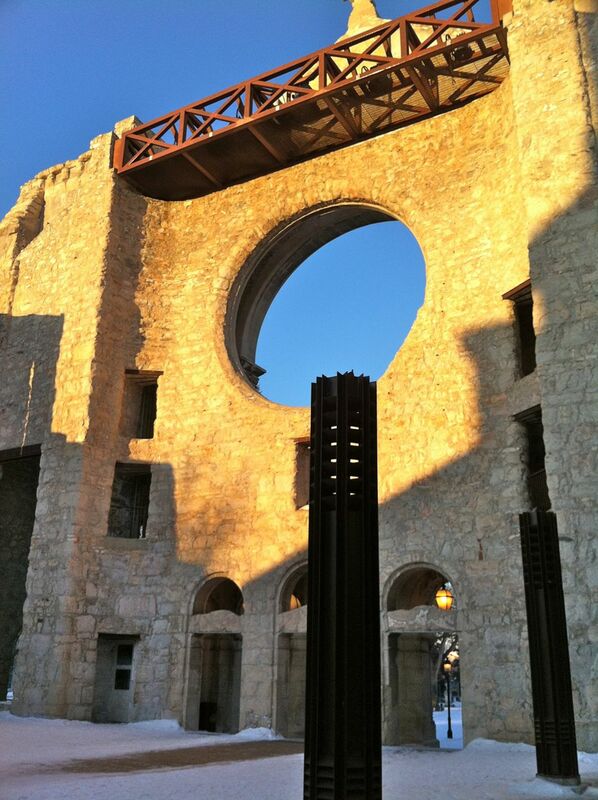 To this day St. Boniface is home to a number of Manitoba’s most significant historical structures, many of which relate to this early period and these themes. 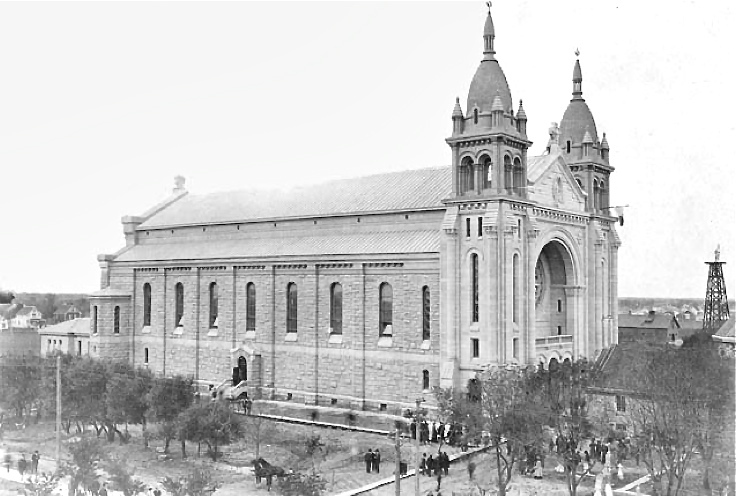 Beyond its religious and educational activity, by the early twentieth century St. Boniface would also develop into an important transportation and industrial centre for Western Canada. Since 1878 facilities for the Canadian Pacific Railway (CPR) were located in the area. Over time St. Boniface would entice all three of the country’s major railways to build locally, with Canadian Northern’s main line and the Grand Trunk Pacific-Transcontinental Railway joining the CPR. St. Boniface would capitalize on the presence of the railways to become a major industrial hub, housing iron, steel, lumber, brick and flour mills as well as grain elevators and factories. In addition to industrial growth, the first half of the twentieth century saw St. Boniface develop a new commercial and civic heart, its nucleus being Provencher Boulevard. 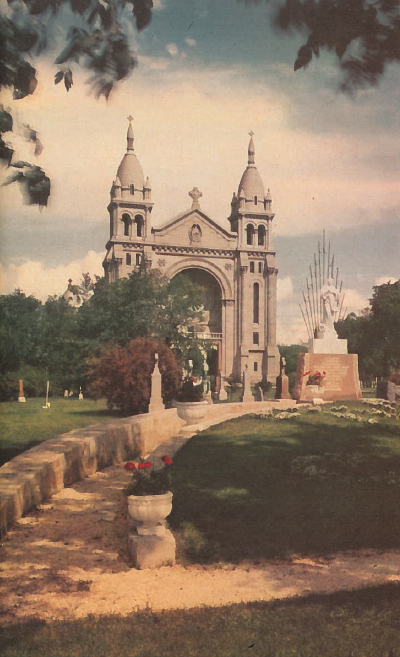 Eastward along Provencher Boulevard, St. Boniface continues to bear the influence of the Belgian community who had first settled in the area in the nineteenth century, many of whom would play an important role in Winnipeg’s building community. 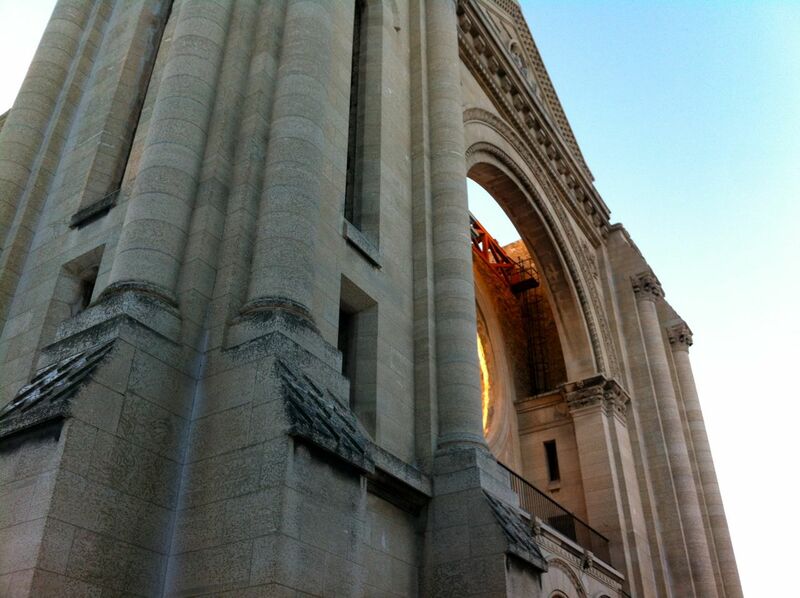 During the middle of the twentieth century, modern architecture found a home across St. Boniface. 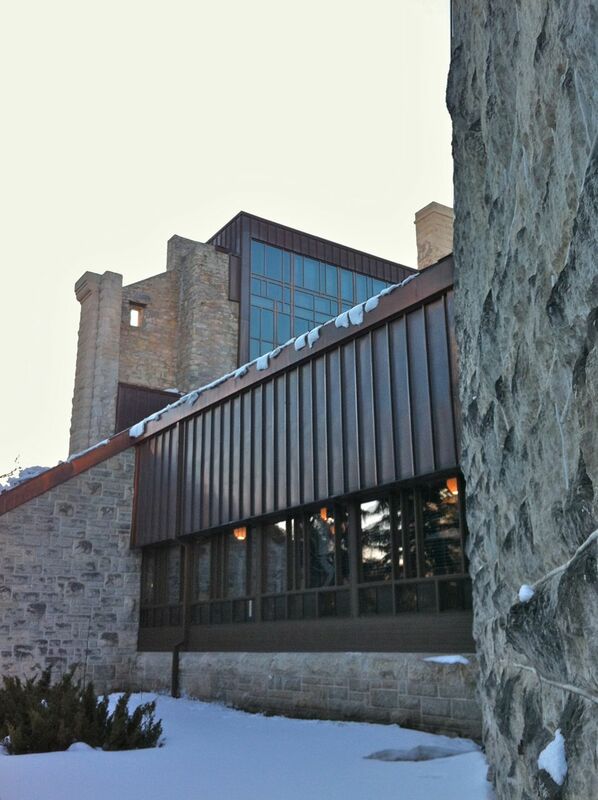 No firm or architect is as associated with modern architecture in St. Boniface as Étienne Gaboury. Indeed, few architects anywhere possess a body of work so closely associated with one community. 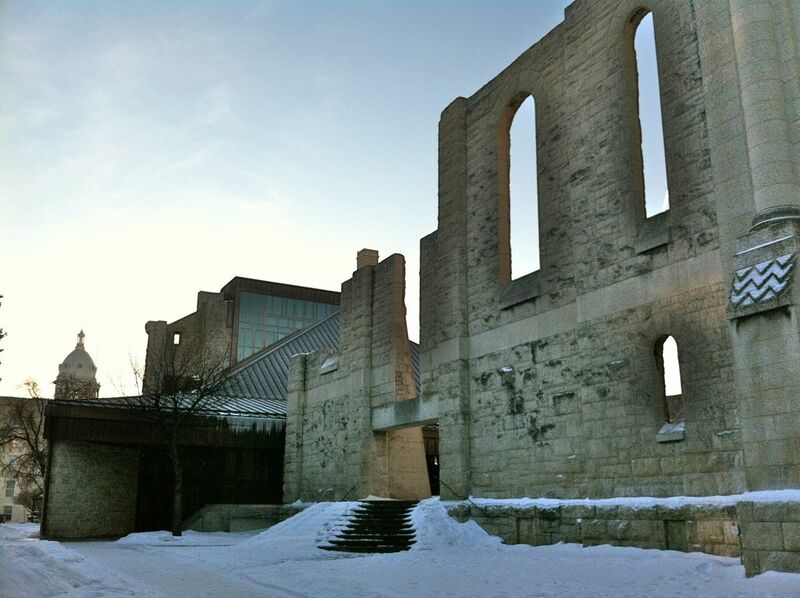 Beyond the Civic Centre, among Gaboury’s works in St. Boniface are the 1963 St. Boniface Clinic, the 1969 Église du Précieux Sang, the reconstruction of St. Boniface Cathedral (from 1970) and the 1974 Centre culturel Franco-manitobain. 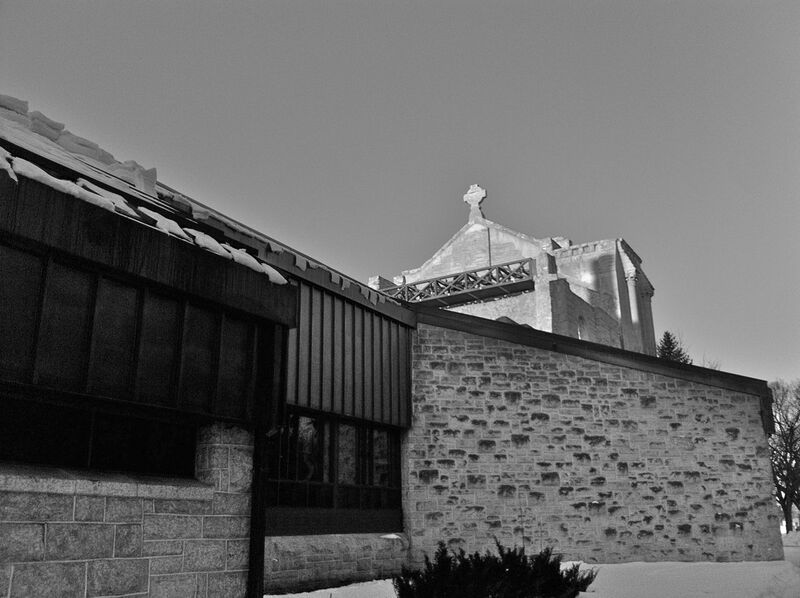 Over the following decades St. Boniface witnessed the construction a many projects of Brutalist and late-modern character, among them small commercial structures on Provencher Boulevard and rue Marion. In 2003 the area gained a new iconic structure, a dramatic cable-stayed footbridge over the Red River known as Esplanade Riel. In line with Provencher Boulevard, the bridge is uncommon for housing at its centre an enclosed space – a cantilevered space home for many years to a restaurant. 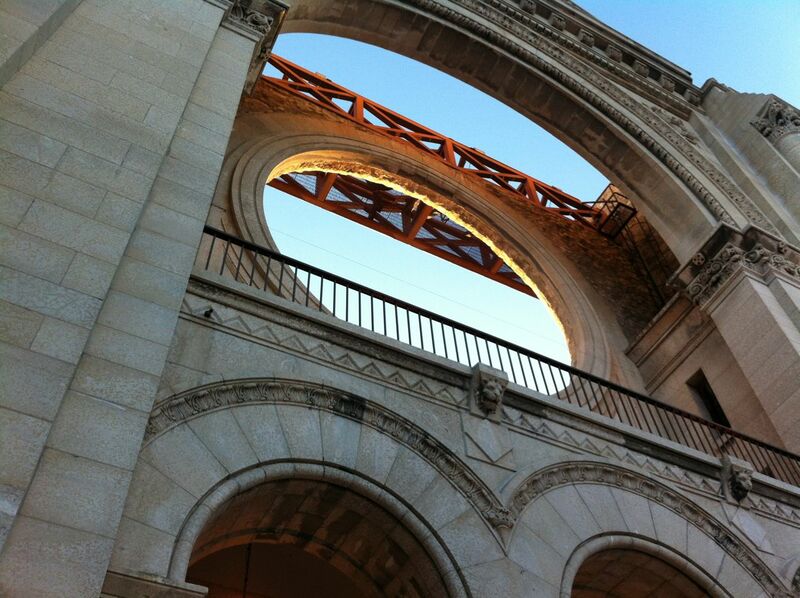 Unbeknownst to many, the bridge is in many ways the culmination of the earlier vision of its architect, Gaboury. 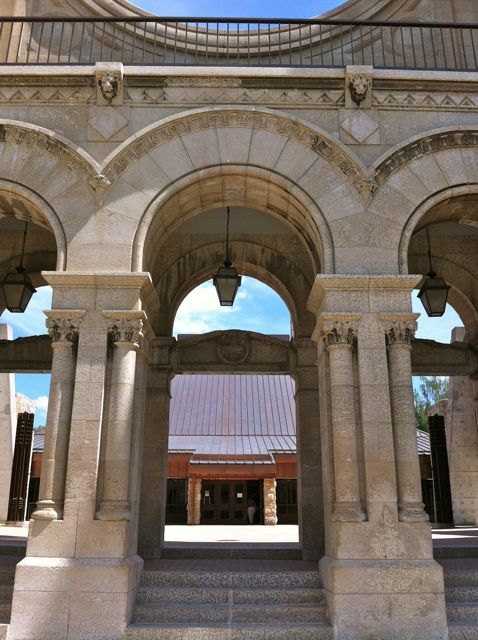 During the twenty-first century St. Boniface has experienced increasing architectural growth, particularly manifested in the development of multi-tenant residential properties and creative additions to St. Boniface Hospital, Université de Saint-Boniface and Centre culturel Franco-manitobain. These projects and others have remade the area through post-modern, neo-modern and hybrid approaches. 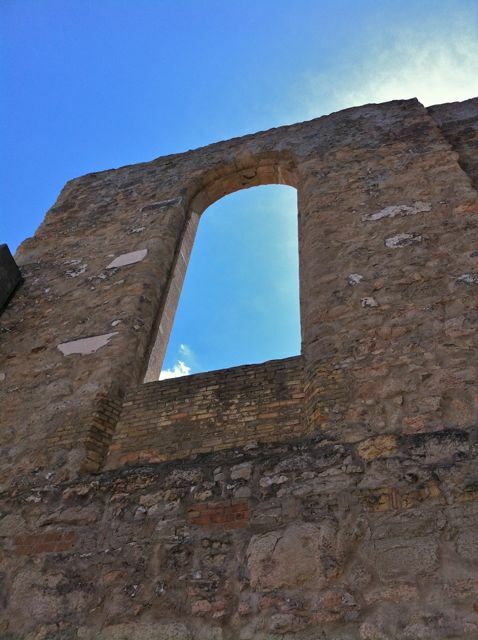 Nevertheless – indeed, often through such evolution – St. Boniface continues to possess a character distinct in Winnipeg, continuing of a long legacy of uniqueness that dates back centuries.